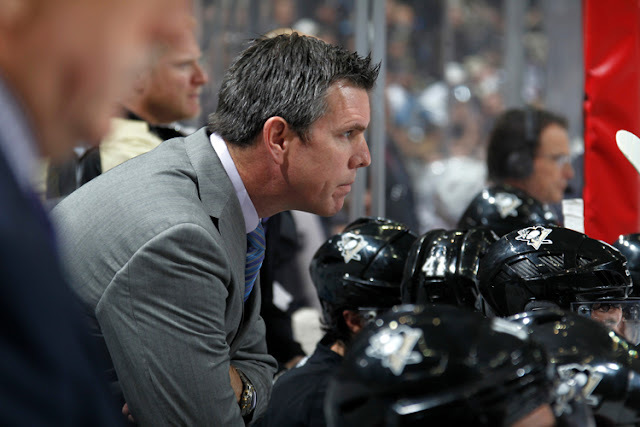 With the past few games, Mike Sullivan has matched and surpassed Mike Johnston in terms of games coached on the season. It's no secret at this point in time the series of events that brought the organization to where it is today. After blowing a 3-1 series lead in the conference semifinals against the New York Rangers, the Penguins cleared house and, after a drawn out and at times embarrassing process, hired Mike Johnston to succeed Dan Bylsma. Johnston had some early success, but questions arose about the simplicity of his scheme for opposing coaches to counter, and the wheels began to fall off late in the season with key injuries in the defensive corps. Despite the abundantly clear problem this presented, and the expiring contract of several top 4 defensemen, the position was largely neglected in the offseason. Johnston attempted to compensate by changing his system, and the resulting changes failed miserably, leading to him being fired and Sullivan being promoted in December. Sullivan has opened things back up, and the Penguins offense has certainly responded to the lifting of the restrictions placed on them, but there are still signs of the lack of defensive depth that plagued Johnston during his tenure. And to be frank, Sullivan really shouldn't be compared to how poorly the team had been performing in the first part of the season. The Pittsburgh Penguins, with the elite talent that they possess, should never look as lethargic and anemic as they did in the first 28 games this season. A more suitable comparison is how they played last season under Johnston, or previous seasons under Bylsma. So keeping that in mind, how does Mike Sullivan compare? It might be easy to point to the similarity in the records between Sullivan and Johnston this season, but the teams could not have played any more differently under the two coaches. While the focus of the 2015 offseason was on reinforcing the group of forwards, both at the top with Phil Kessel and in the bottom 6, Johnston turned away from the strengths of his team to try to reinforce their greatest weakness: the defense. Conversely, Mike Sullivan has played to his teams strengths. Sullivan has the Penguins much more focused on possessing the puck in the offensive zone and using their talented offense to score goals. And that 2.87 goals/gm would be 5th in the league over the course of the season - the same ranking the Penguins' offense had in Dan Bylsma's final season. Sullivan also has the power play back clicking at a level not seen under Johnston, and that's with missing Evgeni Malkin for the past 6 games and the team being scoreless on the man advantage since. The effects of the defense can still be on Mike Sullivan's teams, though the multiple injuries at forward are likely exacerbating the issue as well. The Pens had been fairly consistent the previous 3 seasons in scoring defense across the coaching transition from Bylsma to Johnston. While Johnston had improved upon that number early in the season, it came at an enormous cost to the offense. While scoring against has gone up, and save percentage has gone down, it's not surprising given what's happened to the defense. In Bylsma's final season, the healthy lineup on defense was essentially Kris Letang, Paul Martin, Brooks Orpik, Matt Niskanen, Olli Maatta, and Rob Scuderi. Today Sullivan has Letang, Maatta, Trevor Daley, Brian Dumoulin, Ben Lovejoy, and Derrick Pouliot to work with. It's a huge talent exodus that hasn't been addressed under the current front office, and no matter how talented the team is up front it's going to hold the team back. But Sullivan is succeeding where Johnston failed because of a commitment to puck possession that keeps the play out of the Pittsburgh zone. Whereas Johnston's commitment to defense had the Penguins defending in their zone more than attacking in the other team's, Sullivan has gotten the play pushed towards the other team's goal. In fact, their score-adjusted 54.2 CF% ranks 3rd in the league since he's taken over. It's the team's best mark since the Pens put up a 55.1 SACF% in 2011-12 - Jordan Staal's last season in Pittsburgh. And it goes to show how quickly things can change. Staal's departure created a ripple effect in the bottom 6 that caused them to drag down the rest of the team similar to the defense under Mike Johnston. And Johnston initially was a needed change of pace from Bylsma, who began to lose favor in the dressing room. The Penguins have been playing much better under Sullivan, and they certainly are starting to more resemble their successful teams under Bylsma than they did with Mike Johnston as the head coach. They've deserved better in the win column, but even with all the good that Sullivan has done he still is limited by the lack of depth on the defense. But roster construction is something that other's need to take care of, and Sullivan certainly has the team back on the right track to get back into the championship picture; maybe not this season, but with prudent roster moves certainly sooner rather than later.